Allergies to sulfonamide are common, hence medications containing sulfonamides are prescribed carefully. It is important to make a distinction between sulfa drugs and other sulfur-containing drugs and additives, such as sulfates and sulfites, which are chemically unrelated to the sulfonamide group, and do not cause the same hypersensitivity reactions seen in the sulfonamides. Because sulfonamides displace bilirubin from albumin, kernicterus (brain damage due to excess bilirubin) is an important potential side effect of sulfonamide use. 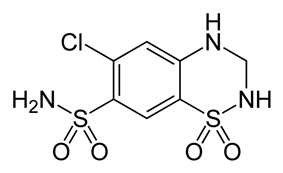 The sulfonamide chemical moiety is also present in other medications that are not antimicrobials, including thiazide diuretics (including hydrochlorothiazide, metolazone, and indapamide, among others), loop diuretics (including furosemide, bumetanide, and torsemide), acetazolamide, sulfonylureas (including glipizide, glyburide, among others), and some COX-2 inhibitors (e.g., celecoxib). Sulfonamide drugs were the first antimicrobial drugs, and paved the way for the antibiotic revolution in medicine. The first sulfonamide, trade-named Gerhard Domagk (working under the general direction of Farben executive Heinrich Hörlein) finally found one that worked: a red dye synthesized by Bayer chemist Josef Klarer that had remarkable effects on stopping some bacterial infections in mice. The first official communication about the breakthrough discovery was not published until 1935, more than two years after the drug was patented by Klarer and his research partner Fritz Mietzsch. The result was a sulfa craze. For several years in the late 1930s, hundreds of manufacturers produced tens of thousands of tons of myriad forms of sulfa. This and nonexistent testing requirements led to the elixir sulfanilamide disaster in the fall of 1937, during which at least 100 people were poisoned with diethylene glycol. This led to the passage of the Federal Food, Drug, and Cosmetic Act in 1938 in the United States. As the first and only effective antibiotic available in the years before penicillin, sulfa drugs continued to thrive through the early years of World War II. They are credited with saving the lives of tens of thousands of patients, including Franklin Delano Roosevelt, Jr. (son of US President Franklin Delano Roosevelt) (in 1936) and Winston Churchill. Sulfa had a central role in preventing wound infections during the war. American soldiers were issued a first-aid kit containing sulfa pills and powder, and were told to sprinkle it on any open wound. The sulfanilamide compound is more active in the protonated form. The drug has very low solubility and sometimes can crystallize in the kidneys, due to its first pKa of around 10. This is a very painful experience, so patients are told to take the medication with copious amounts of water. Newer analogous compounds prevent this complication because they have a lower pKa, around 5–6, making them more likely to remain in a soluble form. 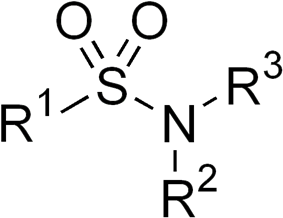 Sulfonamides are prepared by the reaction of a sulfonyl chloride with ammonia or an amine. Certain sulfonamides (sulfadiazine or sulfamethoxazole) are sometimes mixed with the drug trimethoprim, which acts against dihydrofolate reductase. As of 2013, Republic of Ireland is the largest exporter worldwide of Sulfonamides, accounting for approximately 32% of total exports. Sulfonamides have the potential to cause a variety of untoward reactions, including urinary tract disorders, haemopoietic disorders, porphyria, and hypersensitivity reactions. When used in large doses, they may cause a strong allergic reaction. 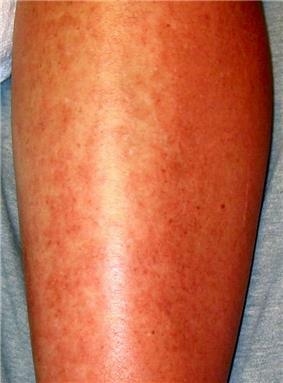 Two of the most serious are Stevens–Johnson syndrome and toxic epidermal necrolysis (also known as Lyell syndrome). ^ Henry, R. J. (1943). "The Mode of Action of Sulfonamides". Bacteriological reviews 7 (4): 175–262. ^ Otten, H. (1986). "Domagk and the development of the sulphonamides". Journal of Antimicrobial Chemotherapy 17 (6): 689–696. ^ Hager, Thomas (2006-09-01). "The Demon Under the Microscope: From Battlefield Hospitals to Nazi Labs, One Doctor's Heroic Search for the World's First Miracle Drug". ^ "history of medicine :: Medicine in the 20th century -- Encyclopedia Britannica". britannica.com. Retrieved 17 January 2014. ^ "History of WWII Medicine". web.archive.org. Retrieved 2014-04-04. ^ a b c d Brayfield, A, ed. (2 February 2011). "Sulfonamides and diaminopyrimidines". Martindale: The Complete Drug Reference. Pharmaceutical Press. Retrieved 28 March 2014. ^ SA Tilles (August 2001). "Practical issues in the management of hypersensitivity reactions: sulfonamides". Southern Medical Journal 94 (8): 817–24. ^ Slatore, C. G.; Tilles, S. A. (2004). 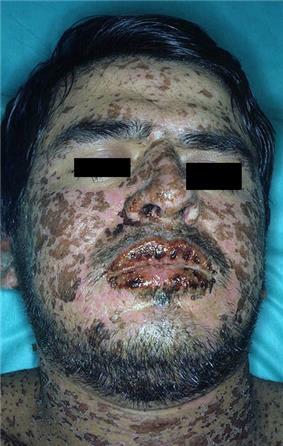 "Sulfonamide hypersensitivity". Immunology and Allergy Clinics of North America 24 (3): 477–490, vii. ^ Knowles, S.; Shapiro, L.; Shear, N. H. (2001). "Should Celecoxib Be Contraindicated in Patients Who Are Allergic to Sulfonamides?". Drug Safety 24 (4): 239–247. ^ Veroni M. "ALLERGIES TO SULFONAMIDE ANTIBIOTICS AND CROSS-REACTIVITIES". Western Australian Therapeutic Advisory Group. Retrieved 2014-02-07. ^ CC Brackett; Singh, H; Block, JH (July 2004). "Likelihood and mechanisms of cross-allergenicity between sulfonamide antibiotics and other drugs containing a sulfonamide functional group". Pharmacotherapy 24 (7): 856–70.